It's never too early to learn computer coding! With innovative, interactive paper engineering, My First Coding Book is a playful, hands-on introduction to offline coding and programming that will give children ages 5 to 7 a head start. Filled with puzzles, mazes, and games to teach the basic concepts of sequences, algorithms, and debugging, this book will help children develop critical thinking, logic, and other skills to cement lifelong computer literacy. Supporting STEM and STEAM education initiatives, computer coding teaches kids how to think creatively, work collaboratively, and reason systematically, and is quickly becoming a necessary and sought-after skill. 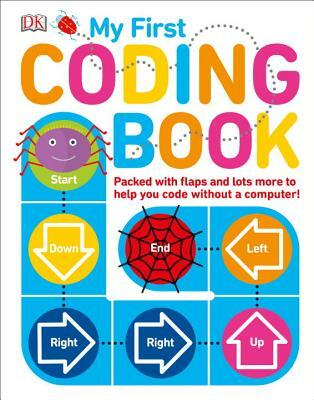 DK's computer coding for kids books are full of fun exercises with step-by-step guidance, making them the perfect introductory tools for building vital skills in computer programming. Kiki Prottsman is Education Program Manager at Code.org and a former computer science instructor at the University of Oregon. As a champion for responsible computing and equity in both CS employment and education, Kiki works with many organizations to improve the experience of girls and women in STEM. She currently sits on the Advisory Board for Wonder Workshop Robotics, and is a member of the Leadership team for the Oregon Girls Collaborative Project. Kiki is based in Eugene, Oregon.